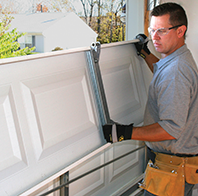 Garage Door Panels often take many hits dings and dents with no problem. Every once and a while someone will mistake a gas pedal for their break, or drive for reverse. sometimes its just a kid going to fast on a bike, wind or other objects hitting the door. Whatever it may be we've got you covered. At times we are able to repair a small ding, dent or crack.